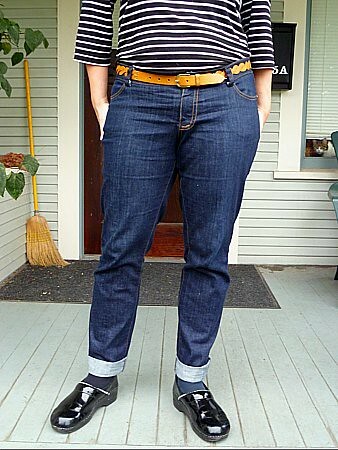 Making your own jeans is not difficult. 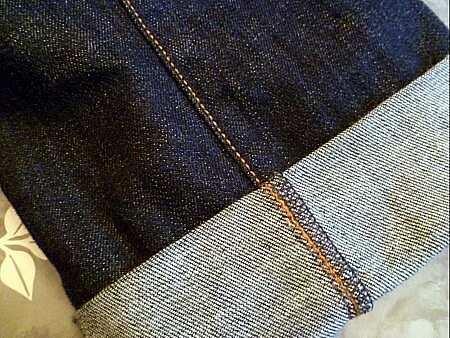 Sure, some of the techniques involved may seem advanced, such as a fly front and flat felled seams. But really the most difficult part is finding a good pattern. Enter the Canadian pattern company, Jalie. I've worked several times with their knit patterns with great success. I find the sizing to be dependable and true and the grading accurate. In other words, the pattern is proportional sized both up and down, providing a well fitting garment. 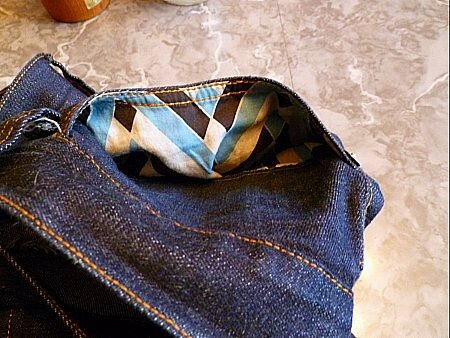 Look inside several pairs of store-bought jeans for tips, suggestions, and guidance when it comes time to craft your pair. If you're nervous, practice the fly front on some scrap before moving on to the real garment as a way to prevent any mishaps. Don't use a wimpy dress zipper! 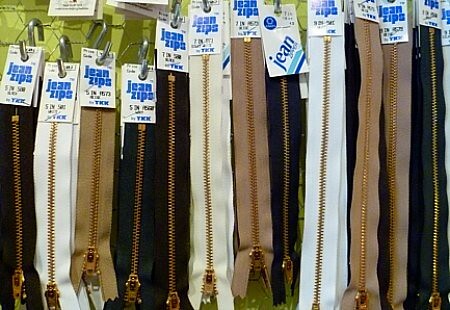 We've got brass teeth jeans zippers in several lengths, including 5" and 7", and in several shades including navy, black and white. 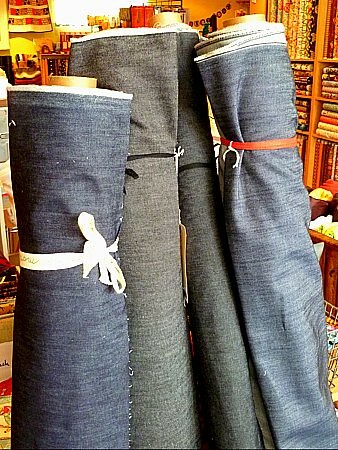 Bolt has other supplies needed for custom-making your own jeans. 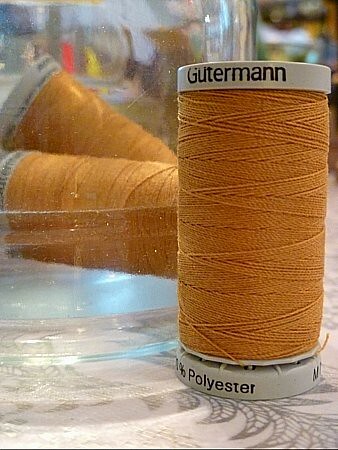 Your pair will never look homemade with the proper gold topstitching and Gutermann provides a heavier thread in just the right shade. And pick up a blue, black, or white shade of 100% polyester all purpose thread for construction. Now for the denim. Sure, a good cotton with a smidge of lycra will work flawlessly everytime, but for a truly unique pair, try our Cotton and Bamboo blend. Or be tempted by the almost black 100% cotton. I am! My first pair is 100% cotton and I did taper the leg from the original pattern. By measuring an older pair of mine with a leg shape I liked, I could get the look I wanted without having to alter them after. I also didn't do a true flat felled seam because the seam allowance was only 3/8" and that would give a funny finished look with TINY seams. So I did a fake one--simply stitched my seam, press, and topstitch from the right side approx 3/8" from the original seam. 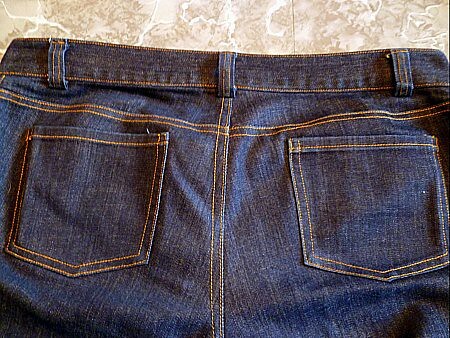 Also the waistband was supposed to be cut on the bias with a center back seam, which only created a gap at my center back. I removed it and recut one long piece NOT on the bias and was much happier. This pair is not perfect, as they were intended to be my muslin and I wasn't sure if they would ever see the light of day. But I love the fit and cut. Now on to my next pair!